Above & Below: Top Toe After Party shown outdoors in partial sun (above) and shade (below). No flash was used. 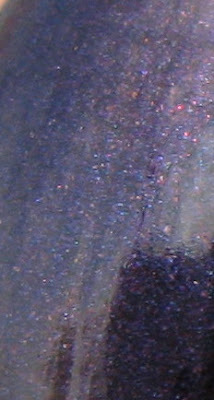 Below: In full sun, the micro glitter becomes more noticeable. Below: Close-up of the finish. You can see some blue in there along with the red. 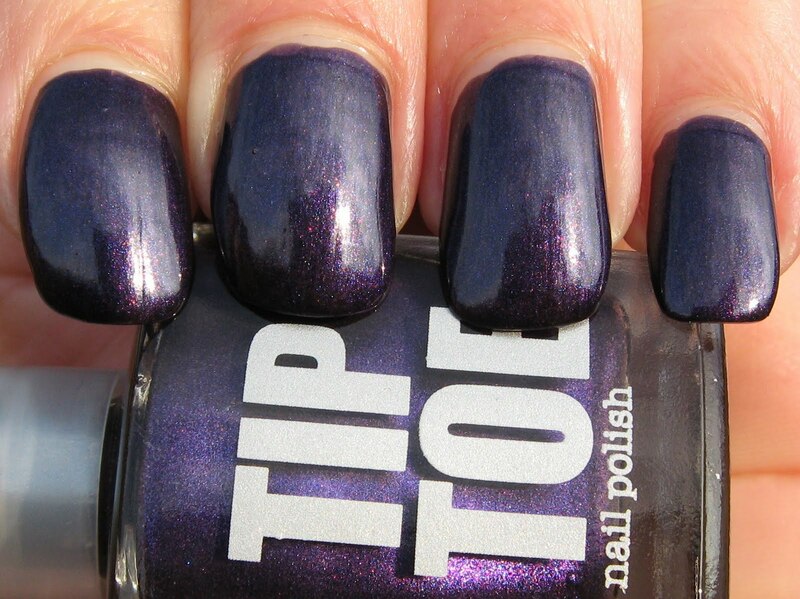 Below: After Party topped with a coat of one of the Blue Cross Snowman polishes, shown in full sun and shade. These have some great glitter in them in various shapes and colors, and can be found at Rite-Aid for $1.99. The bottles are difficult to hold when taking pictures though! After Party is a dark purple shimmer that isn't as interesting as I thought it might be. The micro glitter is most notably red, but only comes out in brighter lighting or sunshine. It's not a bad shade, but I'm sure I have others that are similar. 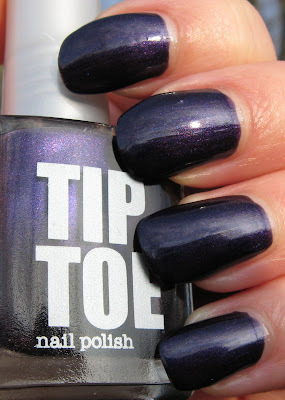 The Tip Toe polishes have excellent coverage though, and they're only $3.50 at Old Navy. Some of the colors are unique, while others are clearly dupeable. If you scroll down, you can see several of the other polishes I've swatched from their line. I used 2 coats with After Party, and then decided to top it off with the Blue Cross Snowman polish in the red-based purple shade. These don't have color names, but they're cute as can be because of the bottle. I have tried them all by themselves, and they're really too sheer to use alone, unless you take the time to do multiple (3-4) coats. They make excellent top coats though, because the glitter is densely packed and it distributes itself very evenly on the nail. What a gorgeous combination! I love the snowman bottle! Another pretty shade on you. Love it with the snowman glitter. Those bottles are just so cute. I love the snowman polish! Very cute, I like the two combined. gildedangel~I just can't pass these bottles up! The formula is much nicer than their Halloween ones too. Evil Angel~they're so cute and festive! Clockwork~hello! The Snowman polish makes a nice topcoat. And I really like these Tip Toe polishes, great application.